MADRID, Nov. 27, Chinese President Xi Jinping met with Spanish King Felipe VI here on Tuesday to cement friendship and strengthen cooperation between the two countries. This state visit is the first of its kind to Europe since his re-election as Chinese president in March and also the first leg of his Europe and Latin America trip, Xi said, expressing hope that the visit will consolidate friendship, uplift cooperation and ensure long-term stability of bilateral ties. Xi arrived in Madrid in the afternoon, which kicked off his three-day visit to Spain at the invitation of King Felipe VI. During his nine-day tour to Europe and Latin America, Xi will also pay state visits to Argentina, Panama and Portugal and attend the Group of 20 summit in the Argentine capital, Buenos Aires. 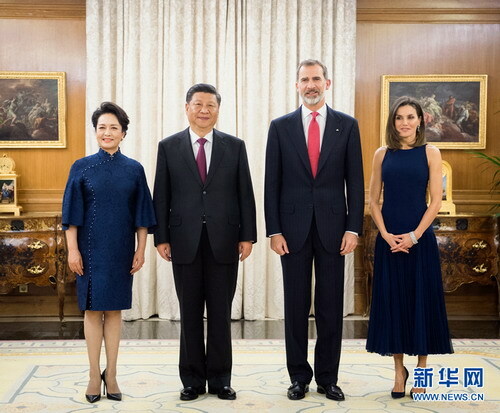 At the meeting held at Zarzuela Palace, Xi said since the two countries established a comprehensive strategic partnership in 2005, China and Spain have been improving the bilateral ties, strengthening political mutual trust, expanding cooperation and maintaining closer people-to-people exchanges. "The Sino-Spanish ties are at the best period in history. I am fully confident in the future of the bilateral relationship," Xi said. The Chinese president stressed that China stands ready to work with Spain to support each other on issues concerning each other's core interests and major concerns. "The two sides should intensify cooperation in such areas as economy, trade, tourism, and third-party markets within the framework of the Belt and Road Initiative, so as to bring the Sino-Spanish comprehensive strategic partnership to a new high in the new era and better benefit the two peoples," Xi said. China would like to see that Europe will continue to advance the integration process and hopes that Spain will keep playing a positive role in promoting the development of the comprehensive strategic partnership between China and the European Union (EU), Xi added. For his part, King Felipe VI said this year marks the 45th anniversary of the establishment of diplomatic relations between the two countries and the 40th anniversary of the first visit to China by former King Juan Carlos I.
Spain values the friendly exchanges and cooperation with China, he said. Since they forged diplomatic ties, the two countries have extended consistent respect and support for each other on issues concerning their core interests, he said. With joint efforts, the two sides have witnessed progress in the development of the comprehensive strategic partnership, King Felipe VI said. Spain is willing to maintain close contacts with China, enhance pragmatic cooperation, strengthen communication and coordination in multilateral affairs, and actively push for deeper EU-China relations, he added.